We know all kinds of locks and Door Hardware! We have over 115 years experience between our four Loxsperts! B & B Locks: A range of locks suited to Guest Houses, B & B and Air B & B operations. We offer locks that can be operated by pin-code, by BlueTooth, or mobile app. Also locks with the facility to send codes or access permission remotely to Guests before they arrive. Visit our Guest House Locks page. Coin-Operated Locks: Mostly used on public toilets to keep vandals out and keep toilets clean. A Mechanical lock operated by inserting a Coin of a certain value (Usually R 2.00) or a token, it operates without power! Click on Coin-op Locks for more information. Electronic coin operated devices usually consist of a steel box to hold the electronics and the coins, which requires low-voltage power to operate a (separate) electric lock or striker via a cable when the correct coin is inserted. .
Cupboard Locks: Small locks intended to be fitted to cupboard doors and drawers. The better ones are fitted with pin-tumber cylinders . Abloy, CISA, Evergood, First Lock, Guub, Hafele, Solid, Union. Dead Locks A mortice deadlock is a lock that has no ‘live action’ or automatic latch – it can only be manually locked or unlocked – usually by key from both sides. Read Deadlocks for additional security to learn more deadlocks . Thumbturn cylinders are also available. Thumbturns should NOT be used where there is glass on or near the door. Read Cylinder patterns to see the types of cylinders that may be used in cylinder locks. 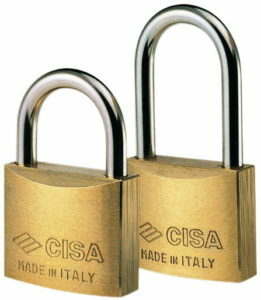 Abloy, CISA, Dorma, ISEO, Legge, Mul-T-Lock, Union, Viro, Yale. Digital Locks: A locking device operated by inserting the correct digits (usually in the correct order and often within a certain time-window). The name is also often used to describe a digital keypad operating as a switch for an electric lock or striker. Digital padlocks and cam locks are also available. 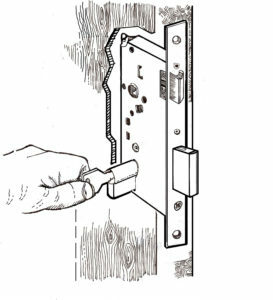 Drop-Bolt locks: A lock with a pin that can be withdrawn using 12 or 24 volt power. They are available surface mounted and mortice mounted, with fail-safe or fail-secure locking bolts. Some of these locks can be ordered with a key by-pass. Electric Locks are locks that generally operate on low voltage and are used for access control. Read Access Control Hardware compiled by David Miller – an abbreviated selection of the most commonly used access control hardware. Abloy, CISA, Dorcas, Iseo, Mul-T-Lock, Union, Viro, Yale. Gate locks: Hundreds of different gate locks are available in the marketplace. Sadly most of the lever locks with double-sided keys are of very light quality. These light locks take only seconds to break with a crow-bar and should not be used to protect business premises and homes. Cylinder locks are always a better answer. The cylinder deadlock illustrated at right (designed for timber doors) is the lightest lock that should be considered for any external application. Heavier cylinder deadlocks are available that can withstand huge amounts of side pressure and are well worth the extra cost. NEVER accept a quotation for a gate, or approve a drawi ng for a gate, until the lock has been specified and agreed upon; cutting the lock into the gate after it has been galvanised creates opportunities for rust. Rather give the gate-maker the lock/s or a drawing and have the gate made to suit the lock/s. A variety of electric gate locks are available – ask us for more information. Armalock, CISA, CISA Elettrika, Elzett, Union. For more information go to our Security Gates page. Guest House Locks: A range of locks suited to Guest Houses, B & B and Air B & B operations. We offer locks that can be operated by pin-code, by BlueTooth, or mobile app. Also locks with the facility to send codes or access permission remotely to Guests before they arrive. Visit our Guest House Locks page. High Security Locks: A broad term that includes hundreds of different articles, Tell us what you are locking, what the doors are like, who needs to have keys, the nature of the risk being protected etc. and our Loxperts will find a solution. 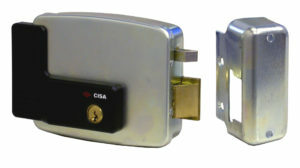 We specialise in high security lock-cylinders, padlocks and cam locks using the CISA ASTRAL TEKNO SO1 key. See Astral Tekno S01 for more information. Jimmy Proof Locks: A surface mounted lock that cannot be ‘jimmied’ open due to an enclosed vertical locking bolt. Often used on double-leaved doors because it locks the two doors to each-other. Knobsets: An American style of doorknob with a built in lock cylinder. Knobs have fallen out of favour because they are hard for handicapped and arthritic people to operate. We do not promote the sale of such locks. Latch Locks: The Term “latch’ usually refers to a lock which latches automatically (as opposed to a deadlock which needs to be locked and unlocked manually). The common Night Latch (or Yale Lock as it is often called) is a Rim Mounted Latch. For better security a morticed night latch is preferred. 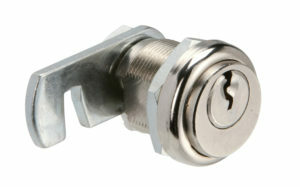 See Latchlocks-for-auto-locking-150902 for more information. Magnetic Locks: Commonly referred to as ‘Mag Locks’ – these locks cannot function at all in the absence of power. Often fitted by people who do not understand lock hardware, mag locks will always require a good battery backed power supply to stay locked. Read more by clicking on Magnetic locks to see the pros and cons. Motorised Locks: The locking bolt of these locks is usually driven by a small 12 volt motor. They are available surface mounted and mortice mounted, in fail-safe and fail-secure. A key bypass can be ordered for many of these locks. Mortice Locks – a broad description of locks that are morticed into the door. The best ones for most applications are Cylinder Mo rtice locks because the cylinder can be changed whenever a key is lost or stolen. 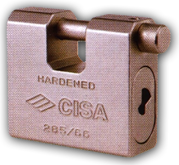 Click Cylinder locks. to read more. 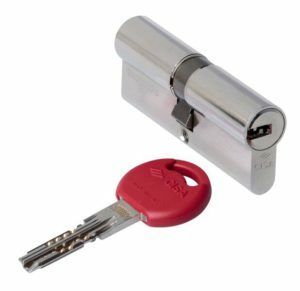 The lock is protected by being morticed inside the door, and the removable and interchangeable cylinder offers great flexibility – including the ability change the cylinder whenever a key is lost or stolen. Read Cylinder locks to see why cylinder locks are preferred for most new buildings and upgrades to older buildings. Cylinders can be master-keyed or keyed alike (read Master-keying and keying alike). They can be removed using a key, and changed to suit the changing needs of the business. Motorcycle Locks: A range of locks with long shackles or with chains, made for motorcycles and bicycles. Master Lock Co.
Night Latches – A Rim mounted lock often referred to as a Yale lock. Most of them can be opened using a credit card or tools, and can also be bumped off the door using force. Abloy, CISA, Union, Viro. Padlock Seals: Tamper-evident seals for padlocks. Note that padlocks may NOT be used on Fire Escapes or Emergency Exits. Panic Locks: Although often referred to as such – panic hardware is NEVER locked from the inside. This hardware is only locked against entry from outside – escape must ALWAYS be free. Also known as Emergency Exit Hardware, Panic Bars, Fire Escape hardware, Crash Bars, Panic Handles, Fire bars. See our PANIC HARDWARE page and read the Panic Hardware For Fire Escapes – an illustrated guide by David Miller for more information. Go to http://www.allandel.co.za for information on Fire-Rated Doors. Rim Locks: A Rim Lock is a lock mounted on the surface of a door or gate. The black steel locks that were formerly fitted on yard-gates are a very low security example. 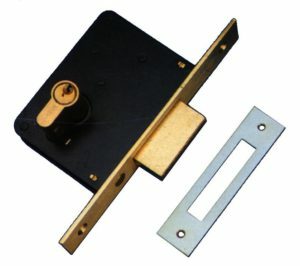 Night latches (also called Yale locks) are another example. Most of them can be opened using a credit card or tools, and can also be bumped off the door using force. The surface-mounted electric lock (seen at right), commonly used on gates and doors are also Rim Locks, but are much more secure owing to the way they are secured to the gate or door. They usually require 12 volts to operate electrically, and can also be opened with a key. 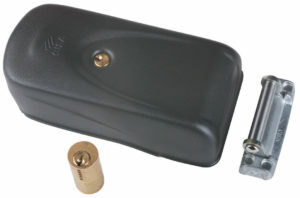 Safe Locks: We sell a range of replacement locks for safes. Furnish full details of size and position of keyhole when ordering. NOTE THAT SOME ARTICLES ARE LISTED UNDER MORE THAN ONE HEADING ABOVE. Principal brand names handled are shown in bold type. We cannot list all items or brands – this is merely a selection! If you do not find what you need here – please ask us – our staff have over 110 years of cumulative experience! We are Registered with the Private Security Regulatory Authority (PSIRA) and have been in the lock and ironmongery business since 1975. Please ask us to assist you. ironmongery for doors & other security items – ask The Loxperts.